This is a excellent area of Tasmania to explore, the trail along to Montezuma Falls is through Tasmanian rainforest which is magnificent. 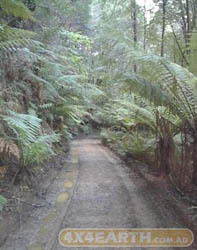 The trail winds in from Williamsford road Williamsford, and continues onto some old tram tracks which lead directly to the falls. This should be planned as a day trip as there is no camping along the trail and no facilities at the falls. There are several river crossings and if you can take the track that leads through the spray tunnel which I think everyone will enjoy. The tracks can be quite narrow so check with the park ranger on these details and for any track closures.